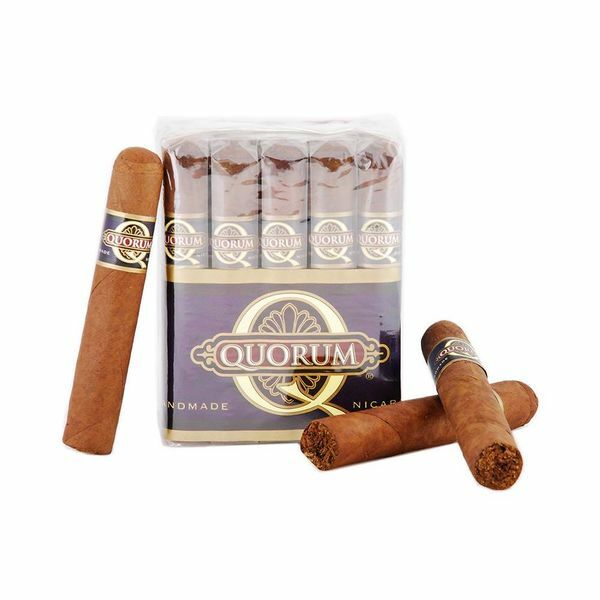 Home made in Nicaragua, the Quorum Robusto Natural is packed with a smooth flavorful blend of filler and binder. The medium bodied cigar is wrapped in an elegant Ecuadoran-Sumatra Natural wrapper which propels a character of sweetness. Initially the smoke is slightly sweet then fades into chocolate and light pepper aromas. The flavors are present throughout the smoke. The dependable consistency and quality of this cigar fulfills the enjoyment of the beginner or most seasoned smoker. The bundle’s price makes it ideal for stocking your humidor. Finding these cigars online at a great price is very easy. Just go to elcigarshop.com! So what is a Quorum except a decent affordable cigar? Definition: The minimum number of members of an assembly or society that must be present at any of its meetings to make the proceedings of that meeting valid. In practice, Congress usually ignores this law and for the time being so am I. For now I’m going to ignore politics and relax with my Quorum Robusto Natural and a stiff glass of Kentucky bourbon. I'd vote for this any time of the year!